Margaret Gardiner (1904-2005) was born on 22 April 1904. An early activist against fascism and war, in 1936 she became honorary secretary of For Intellectual Liberty, a rallying point throughout the Second World War for writers, artists and academics in active defence of peace, liberty and culture. 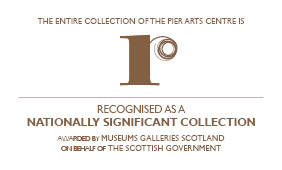 Gardiner gifted her unique collection of art, which charts the development of British Modernism, to the people of Orkney, establishing the Pier Arts Centre in Stromness in 1979. She continued to visit the islands well into her nineties, and died in London on 2 January 2005, aged one hundred. Part of the Pier Arts Centre’s 40th anniversary celebrations, A Life of Giving includes letters, publications and photographs relating to the life and legacy of Margaret Gardiner. The exhibition is part of Insider/Outsider, a nationwide arts festival taking place from March 2019 to March 2020 to celebrate refugees from Nazi Europe and their contribution to British culture.